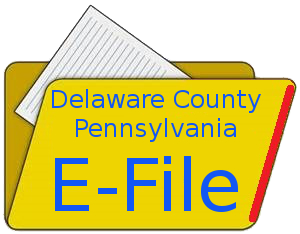 Effective July 30, 2018, Delaware County is pleased to offer electronic filing ( E-Filing) and payment of filing fees through the Office of Judicial Support- Civil Division case management system. Attorneys and Self Represented Litigants may use the system. For the first 90 days, this will only be available in civil (non-Family) cases on a voluntary basis. After 90 days, E-filing will be mandatory in civil cases. E-Filing for family law cases is expected to be made available to attorneys and self represented litigants sometime after the implementation of civil E-Filing. You can read the Local Rule here. On July 24, 2018, the Court's Administrator's Office and the Office of Judicial Support co-hosted a seminar on the use of the new E-Filing system. If you did not have a chance to attend that seminar and would like to view it, you can view it above. There are plans to host more live seminars in the near future. You are also able to submit an application for continuance of a scheduled hearing in an arbitration case, license suspension case or a motion to be heard by the Court on a miscellaneous list. Appeals from the decisions of a Magisterial District Court pursuant to MDJ R.C.P 1002 through 1008. E-Filing is permitted at all times when the system is available. The filing deadline for any document filed electronically is 11:59:59 EST/EDT. CAUTION_- There will be unavoidable times the E-File system will not be operational due to system maintenance , upgrades or unforeseen technical interruptions. If E-Filing is unavailable at the time you attempt to file a document, please file the document in person at OJS. If you believe the unavailability of E-Filing prevented a timely filing to your prejudice, you may submit a motion to the Court within ten (10) days of your unsuccessful attempt to file a document. The motion shall state the date, time of the first unsuccessful attempt to file the document electronically.